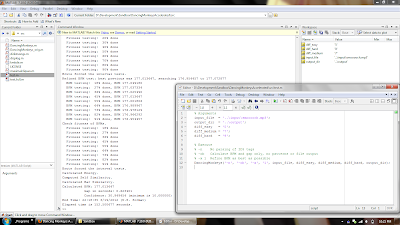 Current working setup now on git; code analysis time! 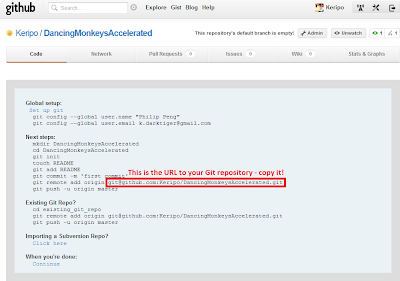 For this project, we are required to use Git for version control and host code on GitHub. As a person who has always preferred SVN (for its linear/incremental nature), and have only had experience with Google Code and SourceForge, setting up a new GitHub repo was a new experience. And so, for future reference, I document the process here. In this tutorial, we install msysgit and TortoiseGit and host code on GitHub. To associate your computer with GitHub, you will need a "public key/private key" pair. You could do this entire process manually with the bash shell, but TortoiseGit gives you a handy GUI tool for it: Puttygen (PuTTY Key Generator). Run Puttygen via your Start menu: "Start -> Programs -> TortoiseGit -> Puttygen". Click "Generate", move your mouse around the blank box for a bit, and wait for the box to fill with your newly generated key. Copy the entire text in the box (right-click -> Select All, right-click -> Copy). This is your public key. Then click "Save private key" and choose a safe place to store the .pkk file (e.g. "TortoiseGit.ppk"), passphrase optional. This file stores your private key. Next you want make your private key accessible to TortoiseGit for authenticating with GitHub. For this, we'll manage our key list with Pageant: "Start -> TortoiseGit -> Pageant". This will add an icon to your taskbar (see picture below). Right click the icon and select "View Keys". 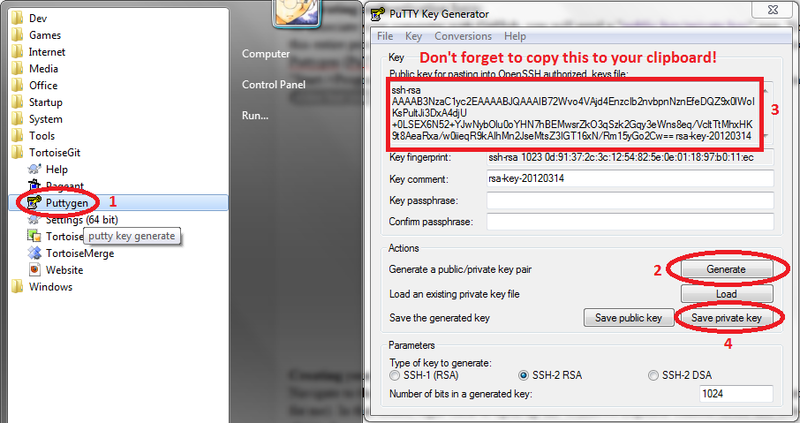 Click "Add Keys" and navigate to your previously saved PuTTY key that is storing your private key file (e.g. "D:\Development\Sandbox\TortoiseGit.ppk"). If added properly, you should see the new key added to the list. Run Pageant and add your private key file. 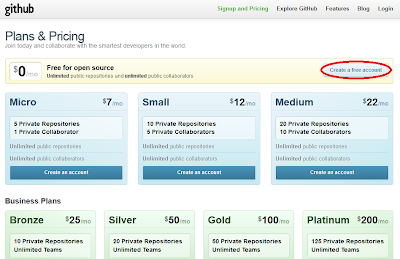 GitHub is a project hosting website that focuses mainly on Git. 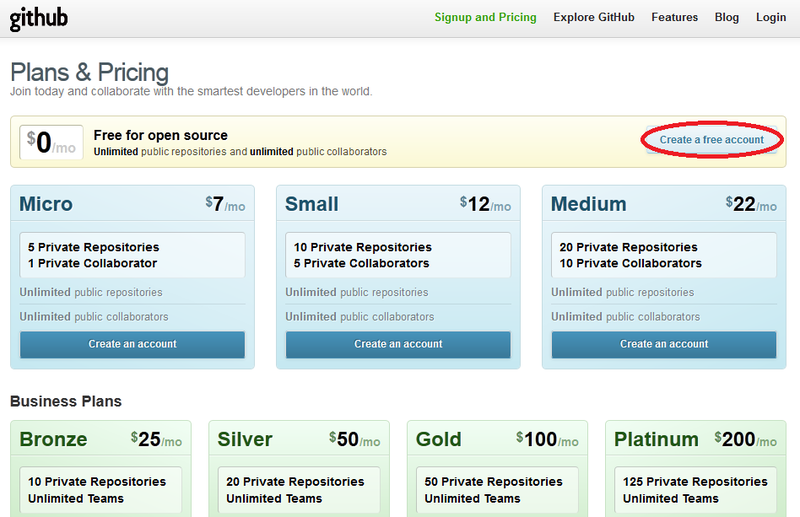 As of the moment, they offer free public repositories and unlimited public collaborators for open source projects. Registration is pretty straightforward - just sign up for a free personal account. Make sure to choose "Create a free account"
Go to your "Account Settings" on GitHub and go to the "SSH Keys" section. 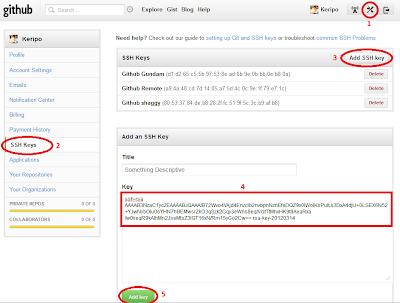 Click "Add SSH key" and paste your public key into the box. Give the key a descriptive title (it doesn't really matter) and then click "Add key". 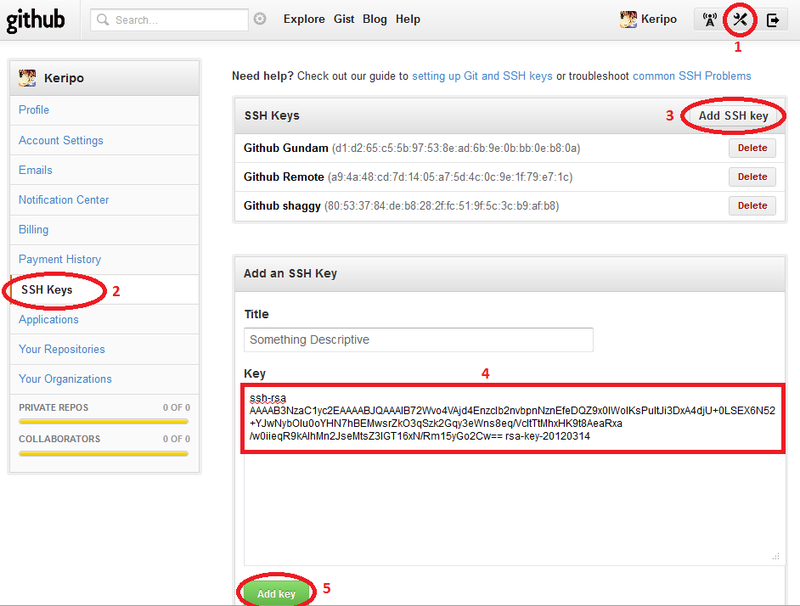 After confirming your GitHub password, you should see the new key added to your "SSH Keys" list. Go to your profile page and click "New repository"
Now that the project has been created on GitHub, its time to create it on your computer! The GitHub page will give you bash commands for creating the new repos, but we'll use TortoiseGit instead. Navigate to the folder/drive where you want your code to be stored (e.g. "D:\Development\Sandbox"). In that folder, right click to open up the Windows Explorer context menu and select "Git clone...". 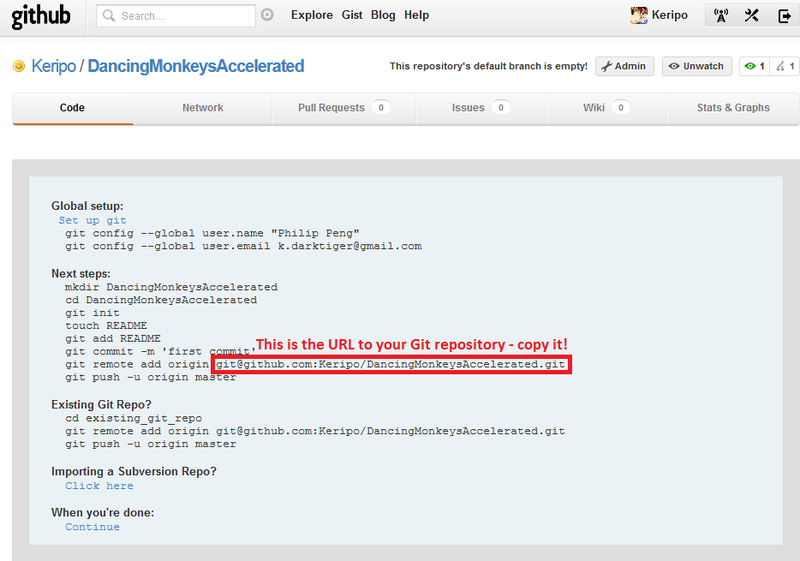 In the popup box, copy-paste the Git repo URL from GitHub (see above picture) and click "OK". Since you've already set up the authentication earlier and its an empty repository, it should be quick (the log will warn you about cloning an empty repo though). If a new folder has been created with the name of your project (e.g. 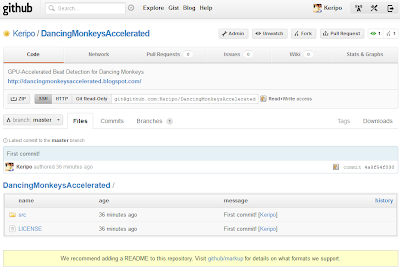 "D:\Development\Sandbox\DancingMonkeysAccelerated"), the clone was successful! 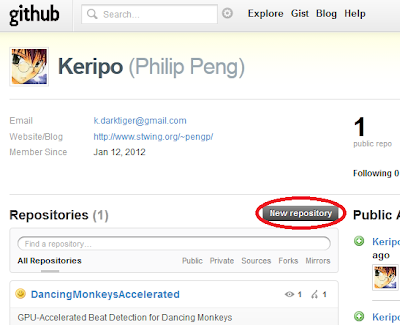 What you have now is a clone of a branch of your repository. Your current branch is probably the master branch assuming you just created a clean project. Go ahead and add files and your code to the folder. Once you're happy with your code/changes, it's time to commit these changes. You can do so by right clicking to open up the context menu in the clone's folder and selecting "Git Commit -> "master"...". This will open up a window that will allow you to add the change message and select what changes you want to commit. If its your first commit, you will want to check the "Select/Deselect All" checkbox to add all your new files. Click "OK" when you're happy to commit the changes to your branch. Note that unlike SVN, this commit is LOCAL ONLY! 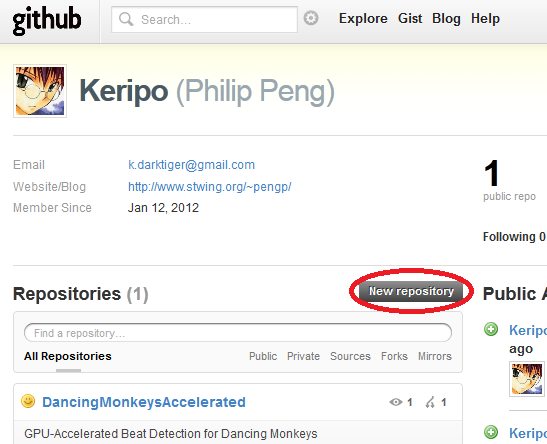 After a few commits, you might want to push your changes to GitHub. 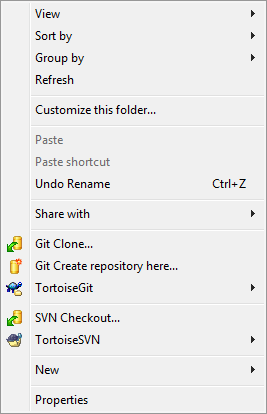 Open up the context menu in the clone's folder and selecting "TortoiseGit -> Push". In the new window, if you also added tags, don't forget to check the "Include Tags" checkbox before clicking "OK". If other project collaborators pushed out changes, you can pull their changes from GitHub with "TortoiseGit -> Pull". To avoid having to manually start up the Pageant daemon every time you want to sync your git repos with GitHub, you can add your PuTTY key to TortoiseGit's Remote settings. 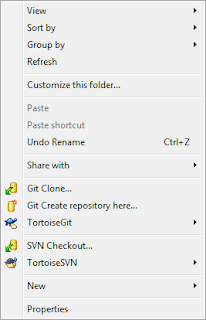 Open up the context menu in the clone's folder and selecting "TortoiseGit -> Settings". In the new window, select "Git -> Remote" and select your Remote item (in my case, "origin"). Locate and select the .ppk file from earlier for the "Putty Key" field and click "OK". Now you don't have to manually start up Pageant every time you reboot your computer! In music-based rhythm games such as Dance Dance Revolution (DDR), a player must accurately perform actions based on visual patterns that match the beat of the background song. These visual patterns are often created by manually by the game developers. This manual process can be eliminated through the usage of software that use beat detection algorithms to aid in the automated generation of such visual patterns. 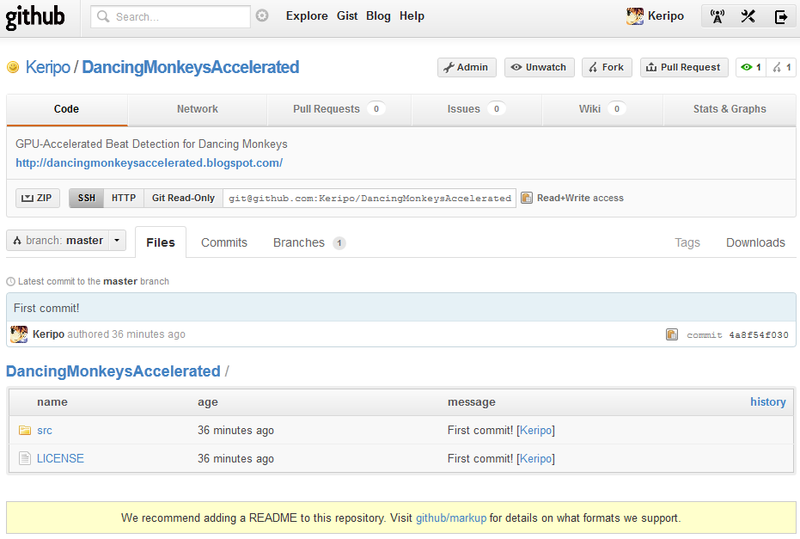 The open source program Dancing Monkeys, written by Karl O’Keefe of Imperial College London, employs beat detection to generate DDR-style stepfiles for arbitrary songs . In this project, I propose the modification of the beat detection algorithm in Dancing Monkeys to take advantage of the parallel processing capabilities of the GPU.. The details of O’Keefe’s Dancing Monkeys program are outlined in his project report . For the beat detection portion of his project, O’Keefe implements a brute-force algorithm similar to the one described by Will Archer Arentz’s paper, “Beat Extraction from Digital Music” . First, a waveform is generated consisting of the highest peaks from the song’s original waveform. This waveform is then smoothed via a low pass filter for easier analysis. The BPM (beats per minute) of the waveform is then determined through brute force comparison tests across the range of 90-200 BPM and checked for best fit. These comparison and fit test are then repeated with narrower ranges. The closest fit is determined to be the BPM if it falls within the acceptable error margin. 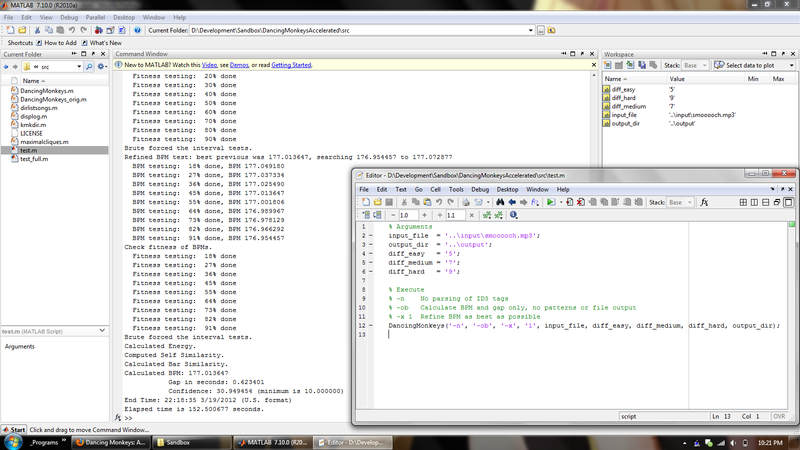 The beat detection part of Dancing Monkeys is written in MATLAB, compiled to run on the CPU, and linear in execution. Due to the brute-force nature of the algorithm and its multiple passes, the process can be very lengthy, often taking twice the duration of the song itself or more (depending on your CPU). Because the comparison and fit tests across the BPM range being checked are independent events, however, this process can be parallelized. In addition, the test process itself is pure arithmetic calculations, which GPU units are well suited for. MATLAB also supports some CUDA kernel integration  and previous works have shown over 10x speedups in GPU-accelerated music beat analysis . By modifying the beat detection algorithm to run tests in parallel and on the GPU, it is possible to significantly reduce the time needed to accurate detect the BPM of the loaded song files. This would allow for significantly faster pattern generation times (compounded if the user wants to batch analyze an entire song library).